In my last blog I showed you how the Base of Support has evolved from Fort Riley to the current Hunter Seat trend. This blog will explain why “Base of Support” as defined by the legendary teacher, George Morris, is only a part of the truth on the flat and over fences. In his “Hunter Seat Equitation”, George Morris defines base of support as the thighs and seat, omitting the knee, leg, and stirrup from the Cavalry Manual definition. I believe it is more beneficial look at what is being produced in the average rider, as opposed to analyzing at a few exceptional riders, to conclude what is happening in horsemanship. Looking at the average rider shows us what is being taught, learned and used, and how theory and definitions effect the many riders who are striving for success. 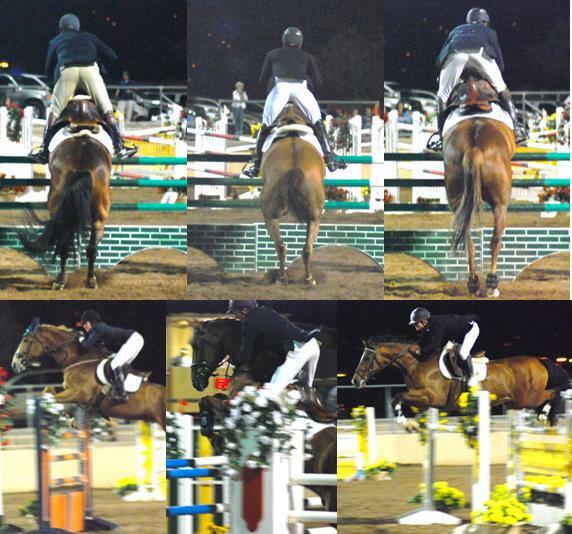 The average rider is compiled in the photo below of six jumps taken at a recent Grand Prix competition. And as a matter of record, these Grand Prix jumps were higher than equitation fences, all of these riders finished the course without falling off and one of these riders is the likely winner of the event. In his book Riding and Schooling Horses, Harry Chamberlin shows how the area covered by the base of support becomes less as the rider goes from the full seat into the more forward jumping seat, which we currently call 2 point. the above pictures show that during the jumping phase, the average rider no longer uses his seat and thighs in 2 point and that the lower leg from just above the knee through the foot becomes the rider’s base of support. This occurs by necessity. A quick Internet search for “base of support” produced the following :”The region bounded by body parts in contact with a support surface or surfaces, such as the ground that exerts a counterforce against the body’s applied force.” In the case of the of our jumping riders in the above photo the base of support during jumping is the knee, calf and foot in the stirrup. According to Mr. Morris’s definition of base of support being the thighs and seat, the riders in the photo have no base of support at all because their thighs and seats are not in contact with anything. Logic says that, according to Mr. Morris’s definition, they are no longer supported on their horse. Using the correct definition needs to be given top priority when it comes to passing information on to a new generation or else we will lose all recognition of sound principles of horsemanship. Logic says that a rider must have a base of support over a jump. If the seat and thigh are no longer in contact with the saddle or horse they can no longer be the base of support. Following Mr. Morris’ definition, what then becomes the base of support over jumps? Has the base of support been diverted from the Cavalry definition of, “The base of support is formed by those parts of the rider’s body in contact with the saddle and horse, from the points of the pelvic bones down along the inside of the thighs, to and including the knees, legs, and stirrups.” to that of the seat and thighs and HANDS? mmmm, Where is this Going? Jumping horsemanship has evolved a great deal since 1900 and much of it has been very good for the horse, but what of our current situation? Does the average rider or average instructor understand what they are doing and teaching? Has the most recent evolution been beneficial? How has it benefited the stability of the rider over fences? And has it been beneficial to the horse? I’ll explore some of these questions in future blogs. As stated in previous blog. We practice what we are taught. And we teach what we know. Having learned in the 1970’s (as most instructor’s today were) there is much leg work to be done. It would seem the trainers / instructors would need a re-schooling and then take it from there. Personally, I would adore to learn how to ride better, even to ride well especially over fences. I have always studied the old Calvary photos with envy in my heart. Lots of 2-point at the walk and jumping with no hands over small jumps in a grid are exercises to make sure your not supporting yourself with your hands….know any other good exercises to do? Thanks for this super blog. I guess I don’t get out much but I can’t believe there are riders at the Grand Prix level doing the crest release, that’s insanity! Its depressing as an aspiring jumper rider that there’s so much crummy riding. It makes it a challenge to find good, solid trainers to take lessons from. I was recently thinking about a new trainer, but then took a look at the numerous pictures of his students on his website all doing the crest release, many with the swinging lower leg to boot. I wish I lived 50 years earlier before George Morris got everyone doing the crest release. @cm Don’t blame George Morris for this abuse of the crest release. If you know anything at all about George or have attended his clinics for 20+ years as I have you would know he is strongly and I mean very strongly opposed to this release being over used by advanced riders. In every clinic I have seen his advanced class being taught how to “jump out of hand” as well as with no hands. The Crest Release is only for beginners and some intermediates to save a poor horses’s mouth from being ripped on by an unbalanced rider. George Morris often rants that he is disappointed that the crest release is being kept beyond it’s original purpose. So don’t blame something on George if you don’t know what he really is teaching. It is the fault of the person’s own advanced instructor not to take them beyond that release. And when you see most of today’s top trainers riding a simple hunter course using a long beginner style crest release, laying elbows on and ducking past the horse’s necks themselves you see where the release style is coming from. What you say is true- to a point. George Morris is not responsible for what someone else’s advanced instructor teaches and his own teaching isn’t the only factor that has caused this dependency to develop. And in the past 20 years George Morris has spoken out against the abuse of the crest release. But you’re referring to George Morris from the 1990s until now and are not accounting for the 20+ years prior to that when George Morris popularized the crest release to the point that if it wasn’t used in equitation classes, riders would not pin. Even though equitation classes are the lower end of the riding scale they set the standard for the riders coming up. When George Morris’s style emerged the automatic release was cast aside. Many of the professionals that are today’s advanced instructors developed out of that group. The over dependency on the crest release and the loss of the following hand or automatic release are unintended consequences of the crest release that George Morris brought to the world of the hunter /jumper show. If you weren’t riding, training or showing in those early years you may not be aware of the profound effect George Morris’ teachings and style had in the H/J/E world, even to the point of turn out. George Morris is the king of turnout- a very good thing- but did you know that before he decided that rider turnout consisted of black boots, beige breeches and a blue coat that people actually wore plaid coats, colored breeches and even cordovan field boots…in the show ring? George Morris’ influence was so strong that in the 80s the show ring was a boring, conforming mass of navy blue coats! The point is that George Morris has singularly been the strongest influence in the H/J/E show world and he is the one who popularized the crest release. And unfortunately it is one of his signatures on the hunter/jumper/equitation show ring. Thanks for your comment. I was hoping someone would speak up for George Morris because I know he is not happy about the growth of the crest release -now. But George Morris also has a tendency to move on to the next stage, which he has done with his teaching on the crest release over the past few years. You make a lot of good points. Yes, I am old enough to know about the early years of George’s influence. I’ll be 60 soon, and I am aware he changed everything for sure—most for the better I think. I like your comment and it brings up a main area of concern . We hear the phrase unintended consequence so frequently any more but I believe what you experienced could bear that label. Equitation classes during the ’70s came to a point that if you sent a student into the ring without a crest release, regardless of how good their automatic release was, would not pin well. We still follow a lot of fashion in the show world but this one caused huge issues because the instructors who were (making their livings according to students show results) pushing the crest release were merely copying George Morris in something they didn’t understand. I remember the day when you would not enter upper level equitation without an automatic release and then watched the day become one that required the crest release. So the unintended consequence seems to be that the followers caused something that was supposed to be a “stage” in riding to become an “end”. I’m certain that George Morris did not intend this and was probably fairly unaware that it was occurring in those years. By the way, I do have great respect for George Morris’ knowledge and remember watching him as a young man when he first brought his students to Long Island. IMHO we have a bit of a mess now that needs some work to undo. We need better basics and better thought processes instilled in instructors and then delivered to students rather than having everyone become one of the lemmings. Thanks for your comment and thank you for reading U.S. Horsemanship.